Melvyn Bragg discusses the history of food in Modern Europe, a cultural as well as a culinary story. Melvyn Bragg explores the history of food in Modern Europe. 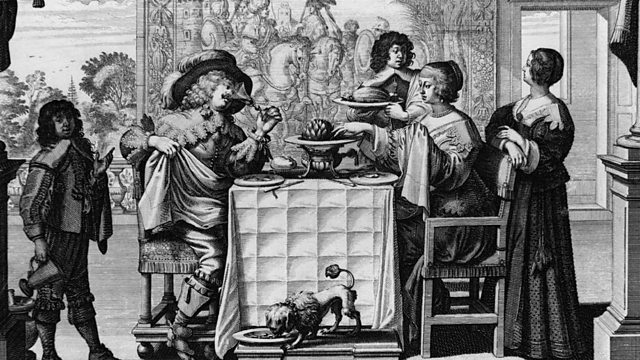 The French philosopher of food Brillat-Savarin wrote in his Physiology of Taste, 'The pleasures of the table belong to all times and all ages, to every country and to every day; they go hand in hand with all our other pleasures; outlast them, and remain to console us for their loss' . The story of food is cultural as well as culinary, and what we eat and how we eat has always been linked to who we are or whom we might become, from the great humanist thinker Erasmus warning us to 'Always use a fork!' to the materialist philosopher Feuerbach telling us baldly, 'You are what you eat'.But what have we eaten, and why? In Europe since the Renaissance how have our intellectual appetites fed our empty stomachs? With Rebecca Spang, Lecturer in Modern History at University College London; Ivan Day, food historian; Felipe Fernandez-Armesto, Professor of Modern History at Oxford University. A selection of archive recordings on making and breaking New Year's Resolutions.